Navigating health, government, legal and even public safety services can be a challenge. It is hard to know who to call and even where to find the number. That is where 211 comes in; the service helps individuals navigate the complex network of human services quickly and easily, 24 hours a day, 7 days a week, in over 150 languages by simply dialing 2-1-1. The 211 service is available in communities across North America and launched in Kingston and the surrounding area in 2010. 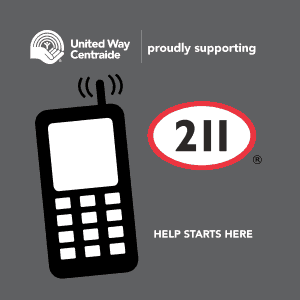 Funded in part by the United Way of KFL&A and the City of Kingston, 211 helps residents connec t with the right services at the right time, and perhaps even more importantly, take some of the burden off of emergency service providers. For emergency responders and emergency managers, 211 works to provide a channel for authoritative information to the public regarding non-urgent needs and services, allowing them to focus their resources on their core mandate. In 2018, 211 answered 283,789 calls in Ontario, connecting individuals with 60,000 community and social services across the province – everything from health care services to housing, as well as senior and youth services. February 11 is 211 Day across North America, a public awareness day, reminding people of the service. In some areas, awareness is still an obstacle. As awareness builds, 211 aims to become a number community members know and trust to provide the right resources and on February 11th they will expand their service to include an online chat on their website and even an email option as well. 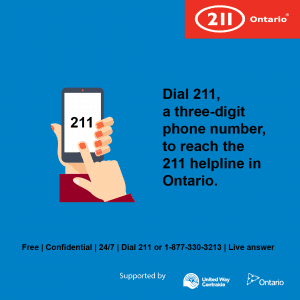 For more information about 211 or to use the online chat option visit https://211ontario.ca/ and for 211 services dial 2-1-1. Community members should always call 9-1-1 for a life-threatening emergency, when a property is in danger or a crime is in progress that requires the police, fire or paramedics.